I like runic, Celtic, Druidic, cave painting, ancient, preliterate, from a time back when you were speaking to the lightning god, the ice god, and the cold-rainwater god. Gagosian is pleased to present new paintings and negative wall sculptures by Michael Heizer. Heizer made the paintings in New York and completed the sculptures in Nevada. Heizer began his artistic career in New York in 1966 with a series of geometric canvases painted with PVA latex, applied with a roller. He worked between the city and eastern Nevada intermittently and reopened a painting studio in New York in 2015, continuing his production of hard-edge shaped canvases and developing a new series of "wet" paintings, utilizing poured and scraped mineral pigments. Each canvas combines drawing, painting, and printmaking with seamlessly integrated results. The unique and arrestingly modern Wet Paintings (2015–) employ unanticipated forms for their overall structures. Heizer poured and squeegeed solvent and water-based metallic paints, imparting to each canvas a dimensional topography. The thickly pigmented, uneven geological surfaces of some of these paintings are reminiscent of the topographies found in his dirt and rock sculptures, such as Dragged Mass (1983). The Wet Painting surfaces also incorporate silkscreened lines, which have been radically enlarged from small notations. Delicate contrasting halos painted around the edges of some canvases further emphasize their distinctive shapes. The Hard-Edge Paintings (2015–16) are the latest iteration of paintings begun in the 1960s, and illustrate Heizer's continued interest in positive and negative sculpture. The shaped canvases are propelled by a personal lexicon evolved from a broad base of reference, which includes European, Egyptian, and Mesoamerican art. Heizer's sculptures are known for their size, raw materials, and ability to awe viewers, both inside and outside of the gallery confines. In this exhibition, Heizer once again shows the versatility and adventure of his concepts and actions through two negative wall sculptures. Fragment A (2016) is a 14-ton granite rock which appears to burst from a steel box embedded in the corner of a room. The granite has a rough, variegated surface with black and gold veins throughout. The size and weight of the rock requires four steel rods running through drilled channels to fix it in place. Black Diorite Negative Wall Sculpture (1992–94), a top-heavy 5.7-ton black diorite granite rock, presents a round, smooth, dark black specimen that hovers precariously over the viewer. Both rocks recall the permanent outdoor installation at LACMA, Levitated Mass (2012). 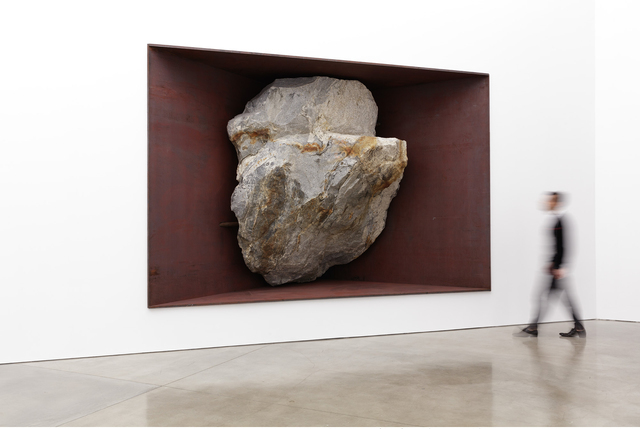 Michael Heizer was born in Berkeley, California in 1944, and lives and works in New York and Nevada. His work has been collected and exhibited by Whitney Museum of American Art, New York; Metropolitan Museum of Art, New York; Dia:Beacon, New York; Museum of Modern Art, New York; Los Angeles County Museum of Art; Museum of Contemporary Art, Los Angeles; Fondazione Prada, Milan, and many other institutions worldwide. Solo institutional exhibitions include Detroit Institute of Arts (1971); Rijksmuseum Kröller-Müller, Otterlo, The Netherlands(1979); St. Louis Art Museum (1980); Museum of Contemporary Art, Los Angeles (1984); Whitney Museum of American Art, New York (1985); and Fondazione Prada, Milan (1996). Permanent, site-specific sculptures include Adjacent, Against, Upon (1976, Myrtle Edwards Park, Seattle); Levitated Mass (1982, 590 Madison Avenue, New York); 45°, 90°, 180° (1984, Rice University, Houston); North, East, South, West (1967/2002, Dia:Beacon, New York); Levitated Mass (2012, Los Angeles County Museum of Art); and four major sculptures at the Menil Collection, Houston. Double Negative (1969), a land sculpture, remains on permanent public view in the Mormon Mesa near Overton, Nevada. His land sculpture, City (1972–) remains closed to the public pending completion; the land on which the sculpture is located was declared a National Monument by President Obama in 2015. For further information please contact the gallery at [email protected] or at +1.310.271.9400. All images are subject to copyright. Gallery approval must be granted prior to reproduction.